Imagine 100,000 people reaching Financial Independence. Imagine 100,000 people freeing themselves from the need to work for money. Freeing themselves from the forces of consumerism and quitting the rat race. Imagine 100,000 people reaching a point where they have enough. They’ve accumulated enough for support their own needs and they are now free to think about bigger things. Imagine 100,000 people with the discipline and the focus to build a system that allows them to live on their own terms. Imagine 100,000 people and the tremendous skills that enabled them to earn, save, invest, and challenge social expectations to build a life that defies all conventional wisdom. Imagine 100,000 people with a unique power to decide what to do with their time, abilities and resources. Now imagine those same 100,000 people deciding to change their focus from building their own life to helping build the lives of others as well. Imagine 100,000 people apply the discipline and focus the have mastered to work on helping others, from their neighbors to the poorest people in the world. Imagine 100,000 talented people using their unbelievable skills and leverage their experience to tackle the most pressing problems in the world. Imagine 100,000 of the wealthiest people on the planet turning to their fellow and sometimes less fortunate human beings and offering to make their lives better. Imagine 100,000 of the most resourceful people on the planet joining together to make the world a better place. We may not all be at FI yet, but we’re definitely more than 100,000 people in the FI community* and we’re definitely growing. As a community, we have a level of abilities, time and resources that could compare with some large non-governmental and non-commercial groups. We’re a truly global community with a similar set of core values that transcend national borders as well as religious or political divide. Individually we are independent and strong. Together we have tremendous power and we can have a huge positive impact. All we need to do is wake up, decide to unite and go change the world. 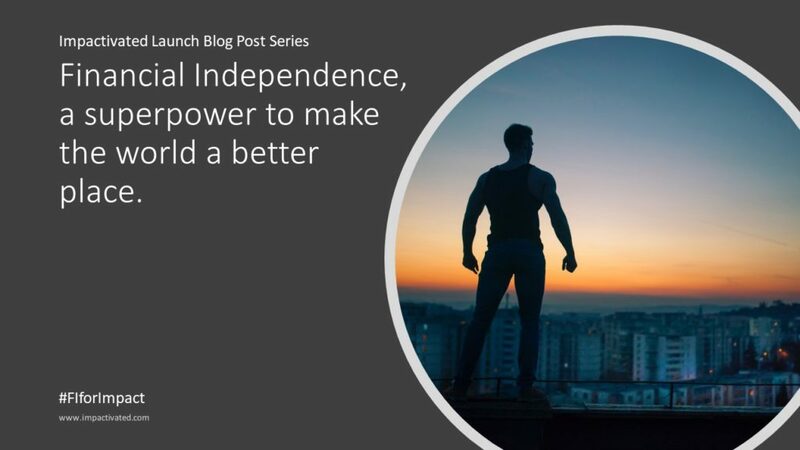 This is the first part of the Impactivated Launch Blog Post Series! In the next blog posts we will explore why the FI community is so well positioned to have a positive impact, how we are already doing a lot of good and how we can do much more good more effectively. Stay tuned! *MMM Forum has more than 42,000 members, the ERE forum has more than 3,000 members, The EarlyRetirement.org forum has more than 32,000 members, the Bogleheads.org forum has more than 81,000 members, The FI reddit r/financialindependence has more than 545,000 members, ChooseFI FB group has more than 40,000 members, SimplyFI FB group has more than 3,000 members. Vicki Robin (Vicki Robin and Your Money or You Life) for her support and encouragement as I developed the ideas for this series. Alan Donegan (Alan Donegan and Pop Up Business School) for inspiring me to take action and turn the ideas into reality. Odin Mühlenbein (Odin Mühlenbein and Ashoka Germany) and Sanjay Ratna for reviewing the post and providing very helpful feedback.